We are entering that wonderful time of year, Fall!!! It is one of my favorite seasons, pumpkins, Halloween, the colors, the warmer clothes, I pretty much can’t get enough of it! Getting to incorporate fall into our classroom play invitations has been very fun too! 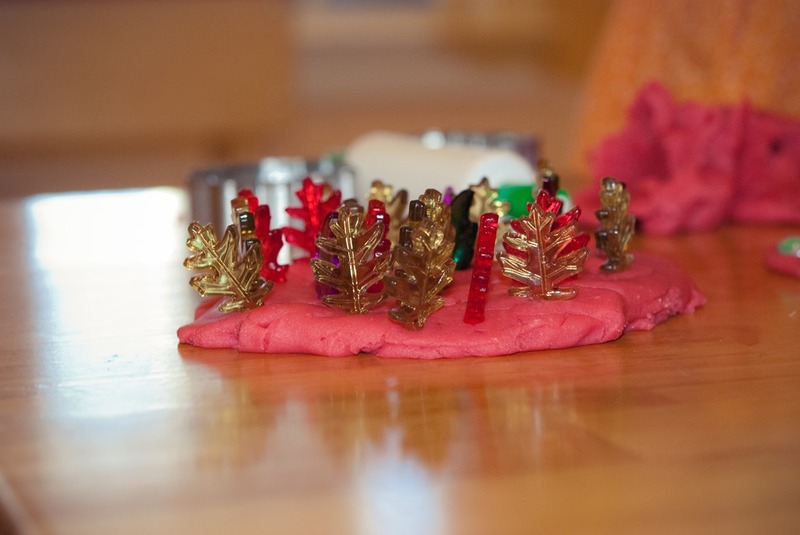 I set up this simple play dough invitation last week. 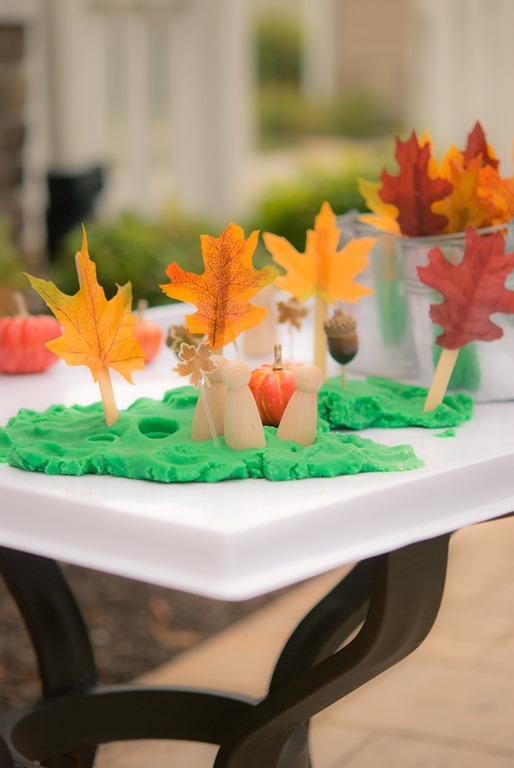 I flattened out play dough, added fall colored leaves with simple popsicle sticks, peg people, acorn sticks, and pumpkins to the mix too! The kids loved exploring the play dough in a different way. 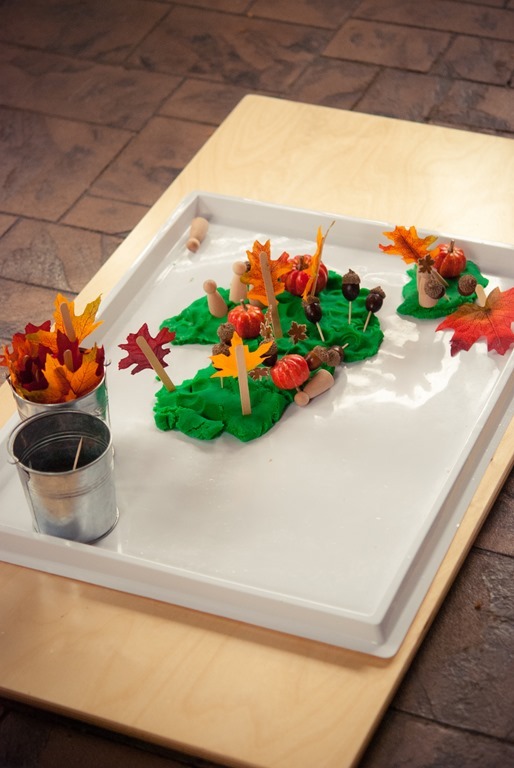 They weren’t manipulating the play dough as much as using it as a canvas to create a fall scene. It got cleaned up and used again and again. 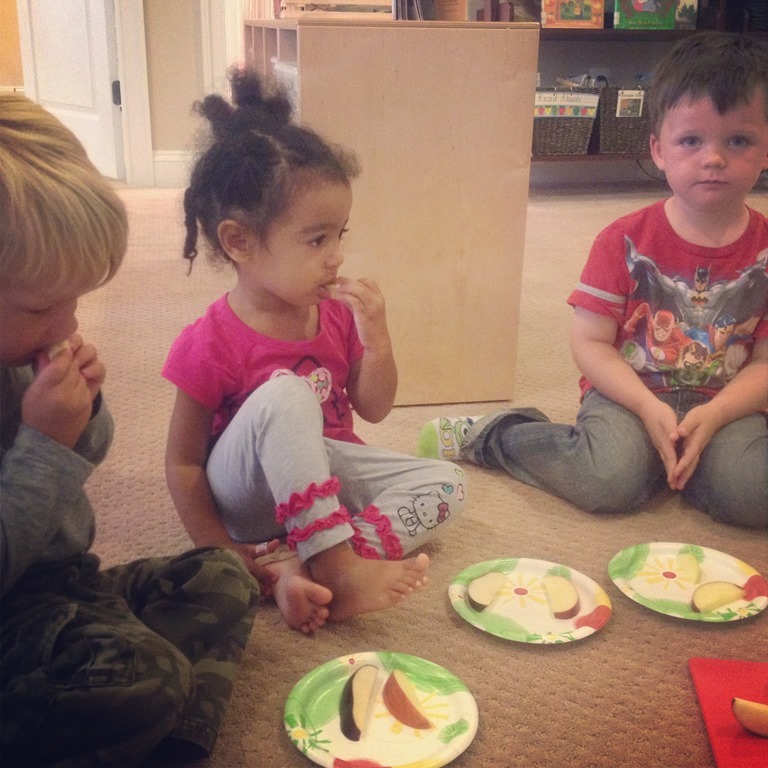 To wrap up some of our discussions of apples we did an apple taste test! The kids got to try as little (or as much!!) of three different types of apples. Then they told me which apple was their favorite and we graphed our answers on a chart. 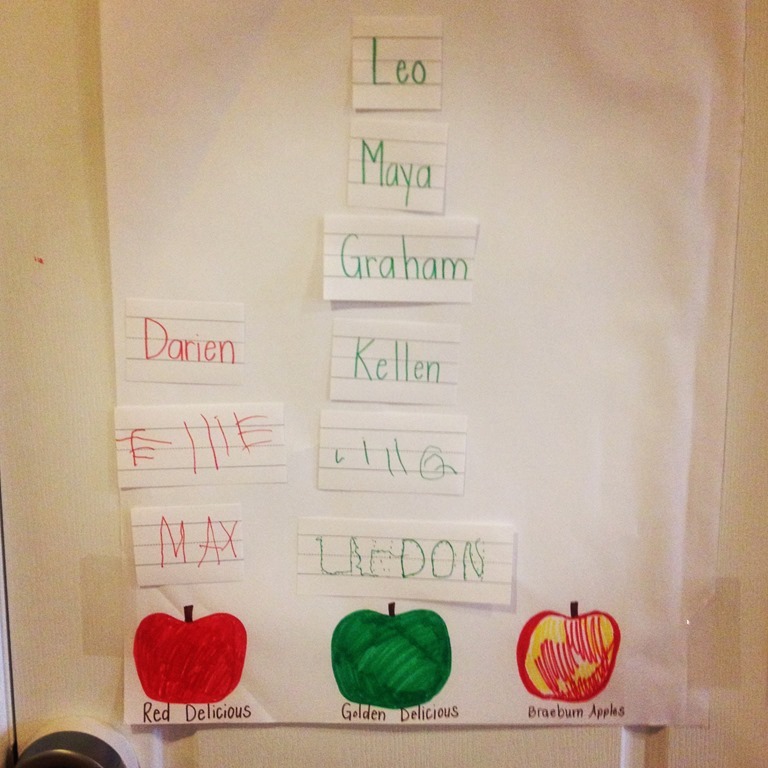 I did this activity with both groups, so they could see which apples were the favorite overall at Crozet PlaySchool! We also made yarn acorns this past week. I thought that both groups would just Love to dip the yarn pieces into the glue and squeeze off the excess before adhering it to the acorn, but many of the children didn’t like this activity. You can tell who enjoyed it based on the amount of yarn they stuck on their acorn. That is the great thing about process art, they just did as much as they wanted and left the project when they had enough of gluing the yarn. One of our fall sensory bins was “Bean and Pumpkin Themed.” I filled the sensory tub up with pinto beans, glittery pumpkins and gourds, silk flowers, and lots of different measuring cups. The kids loved scooping and pouring and transferring beans from one cup to another. 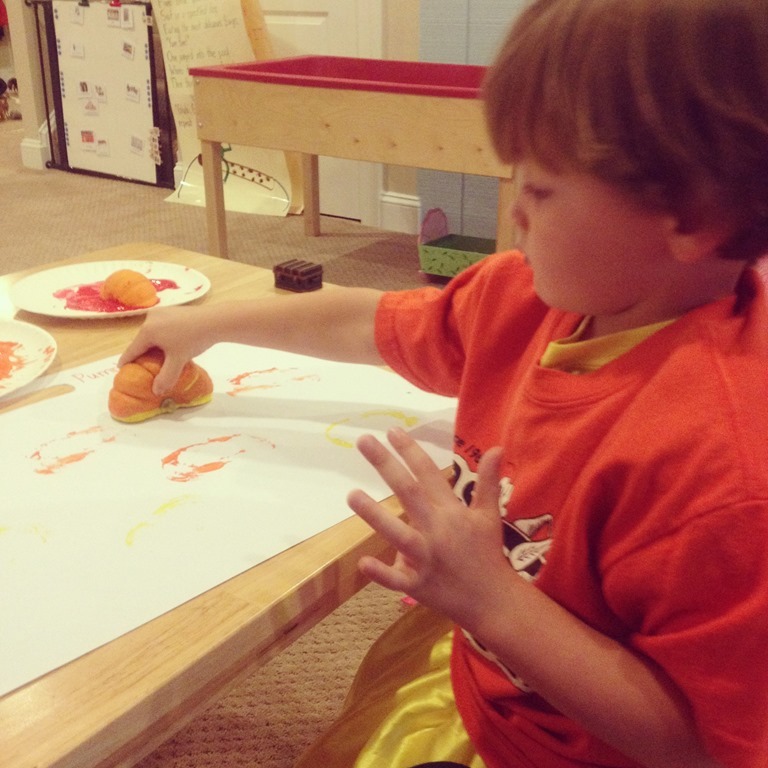 The other fall sensory bin was a pumpkin patch. 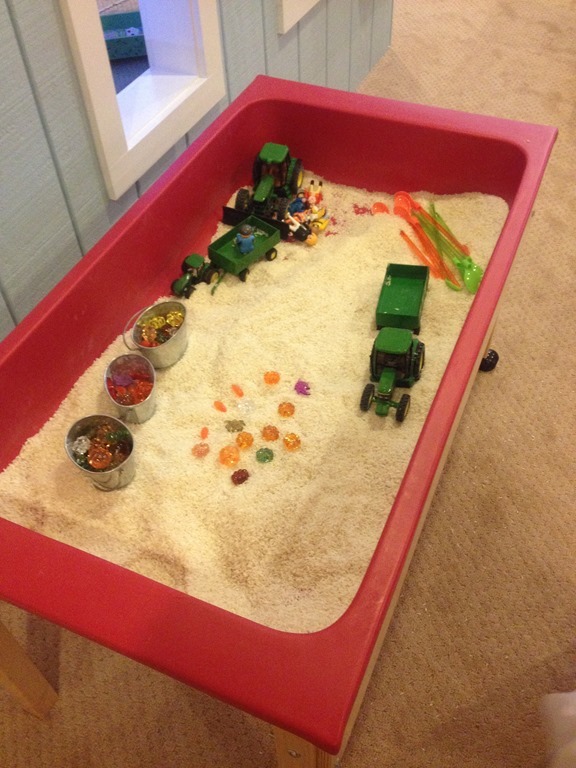 I filled up the bin with rice, pumpkin gems, playmobil people and tractors, and I also found long orange and green spoons that are so inviting to scoop and sift rice with! The kids jumped right in moving the rice around with the tractors and pretending with the pumpkin patch people. 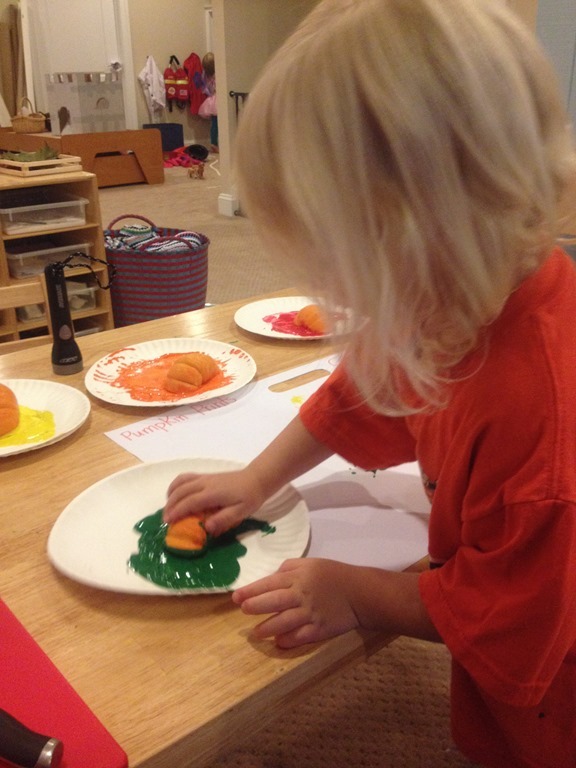 Our pumpkin pie play dough also made its fall debut. I simply used my favorite play dough recipe, added orange food coloring and lots of pumpkin pie spice to the dough. It smells just like a fresh pumpkin pie! On the play dough tray I included, pumpkin toppers on toothpicks, pumpkin and leaf gems, two different silicone wrappers, and lots of craft sticks for cutting and poking in the play dough. And of course we did some pumpkin stamping with our little mini pumpkins cut in half! We have had so much fun diving into all things fall! Categories: education, play based learning, preschool, reggio emilia inspired | Tags: apples, fall sensory bins, fall themed units, fall themes, play dough, playmatters, preschool art, preschool math, pumpkins, sensory, sensory bins, sensory tables | Permalink. The past few weeks have been filled with lots of fun apple activities and some discussions about fall. The weather is starting really cool off in the morning, and I have seen a few leaves beginning to change colors around the neighborhood. Hopefully your children are starting to notice all of these changes as well, because we have been reading about them, discussing them, and playing with lots of apple themed activities. 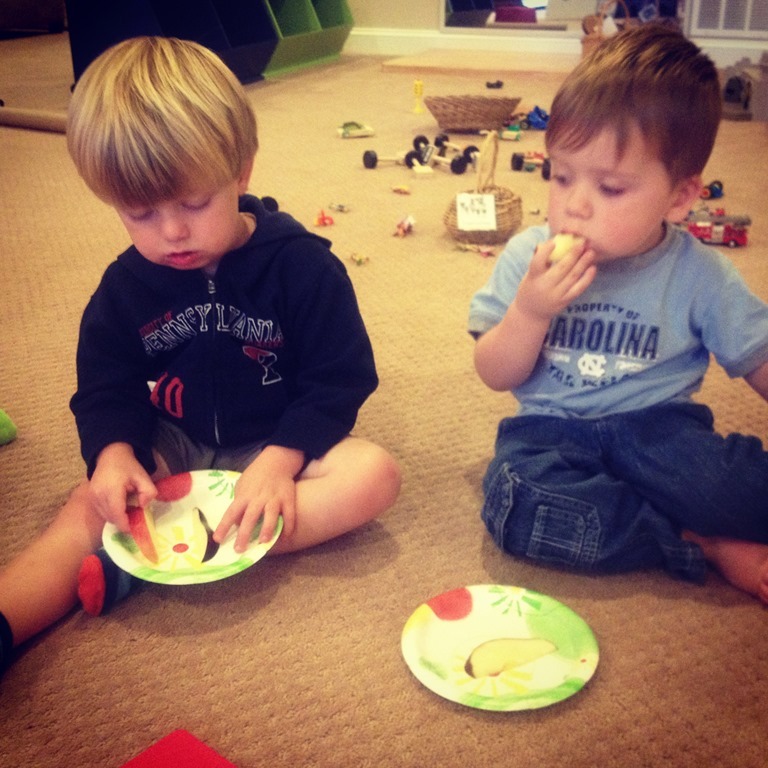 This first picture might be one of my favorite so far from Crozet PlaySchool. 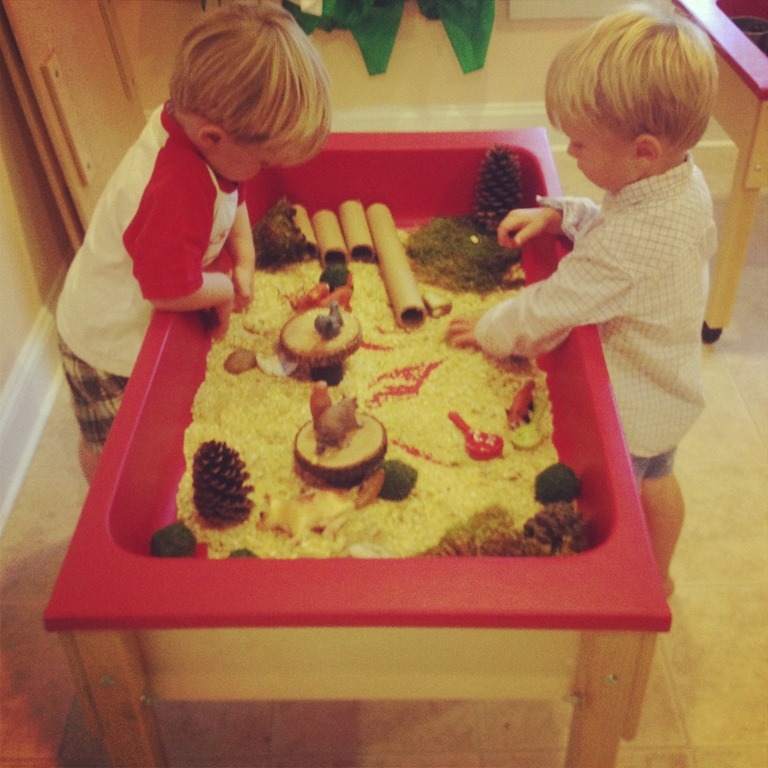 The discussions that happen around our sensory activities are the most engaging conversations. When children are engrossed in learning through their senses, lots of other learning and bonding takes place in the classroom. We all begin by learning about our world through our senses. Babies feel their mother’s touch, they put every and all objects in their mouth as much as we try to stop them, and they crawl around their world feeling and making sense of their environment. 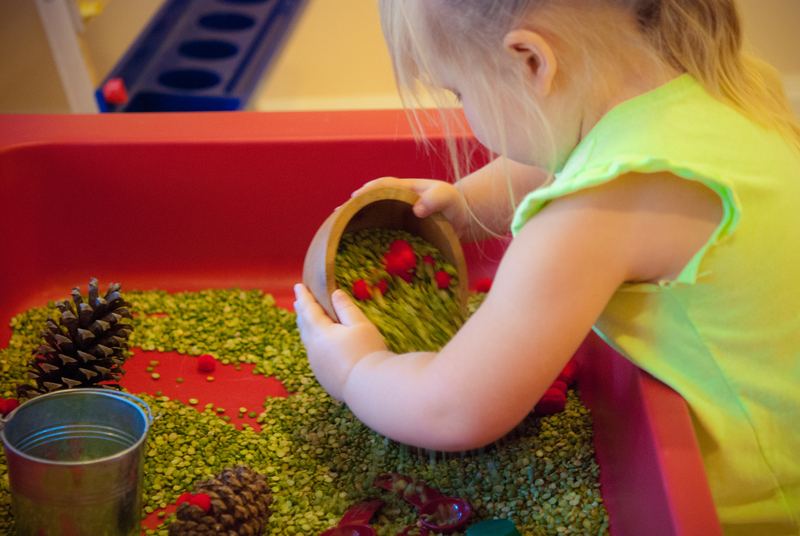 Preschool children love to learn through their senses. 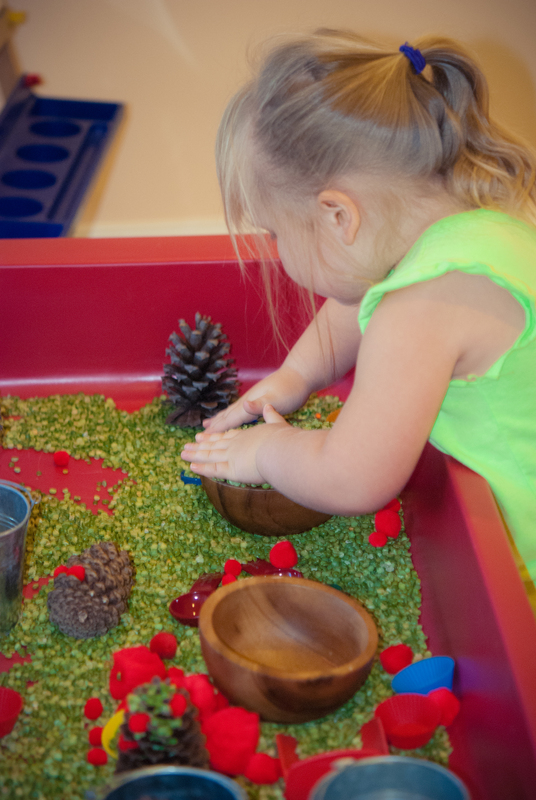 That is why I put such an emphasis on our sensory tubs, play dough trays, and other tactile activities such as art. This is an image of some of the girls around the “Apple Pie Cloud Dough” tub. P is in the middle of a huge discussion with E and C. They are immersed in their exploration, but listening and reacting to her story after she is finished. To make apple pie dough I added cinnamon to the flour for an apple pie scent. Then I took red pieces of sidewalk chalk and crushed them in a ziplock baggie with a meat mallet. I added this to the flour to give it a red hue. 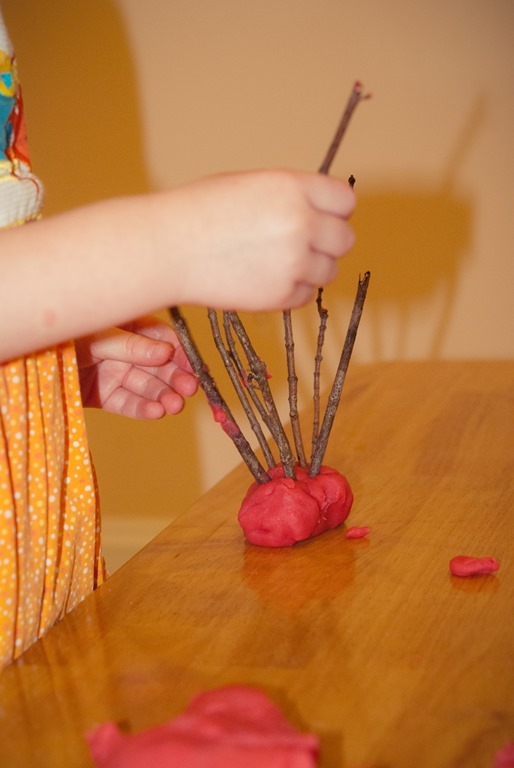 I added apple containers, spoons, and pipe cleaners to make apple stems. You could make your cloud dough many different colors using sidewalk chalk crushed up. Add a number of different scents or spices to your dough. 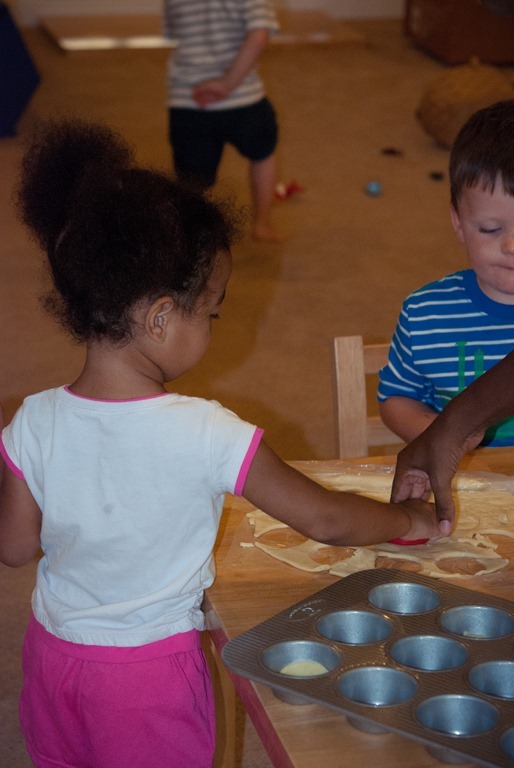 To play with the dough use: cupcake liners, sea shells, stones, spoons, large kitchen utensils, small cups or plates, candles, sticks, muffin tins, animals figures that can be cleaned off, cars or trucks that can be washed off, plastic babies or small figurines, princesses, fairies, etc. 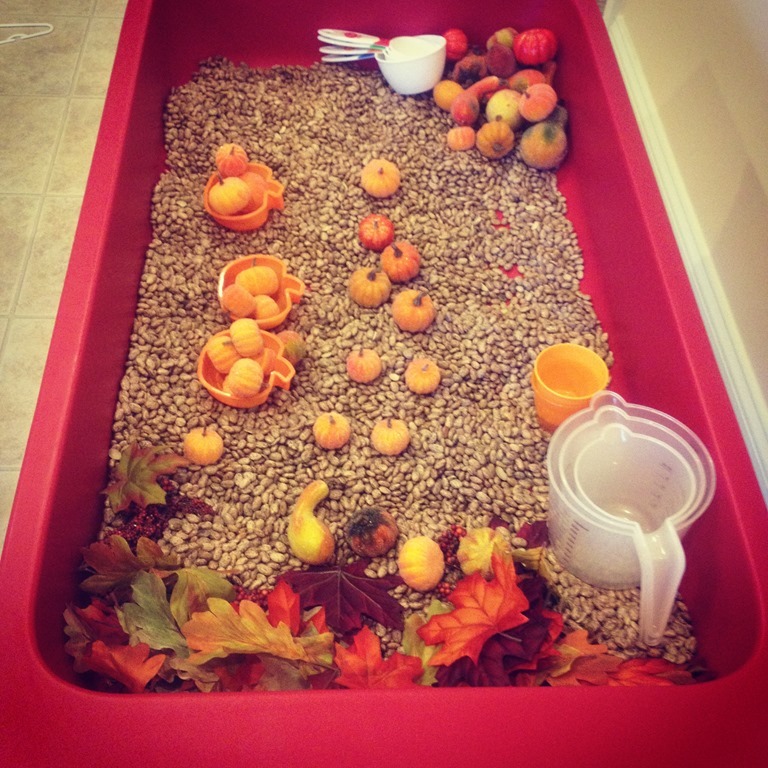 We have also had a lot of fun digging and exploring in our apple picking sensory bin. 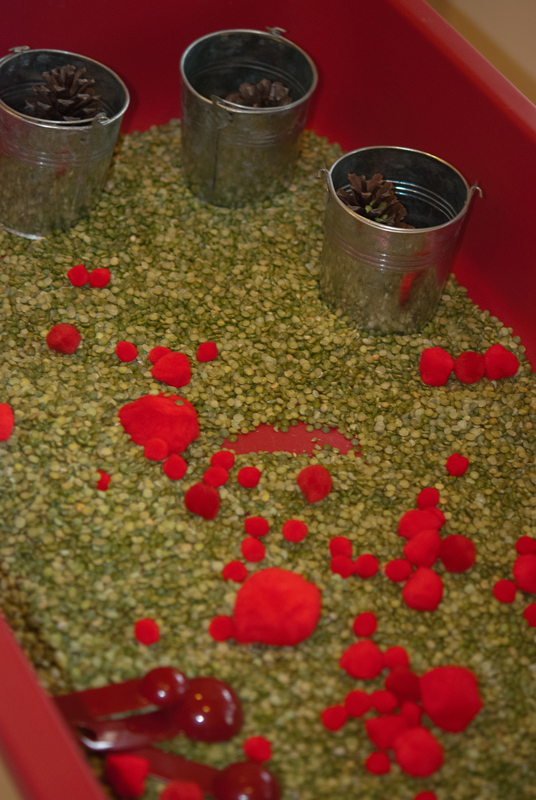 I caught some more pictures of the kids in action in this sensory bin. L was working here for quite some time, baking apple pies, picking apples, pouring and scooping. 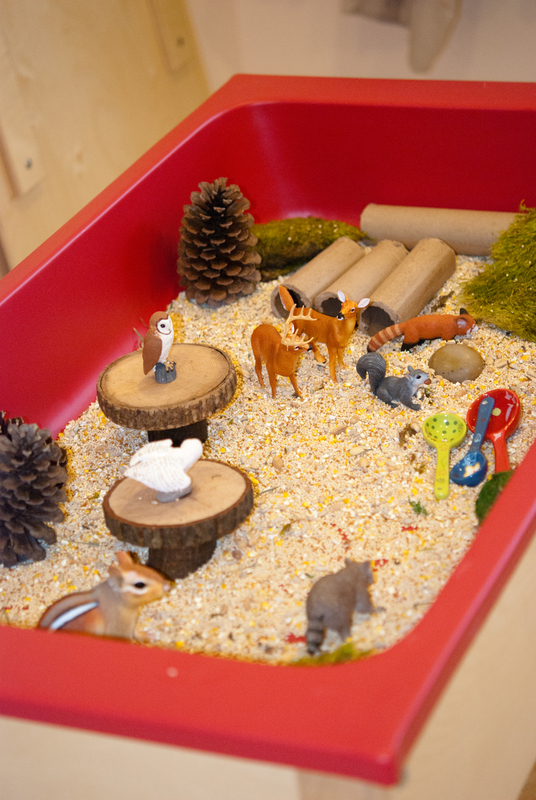 Along with our apple picking bin I also had a Forest Sensory Bin. 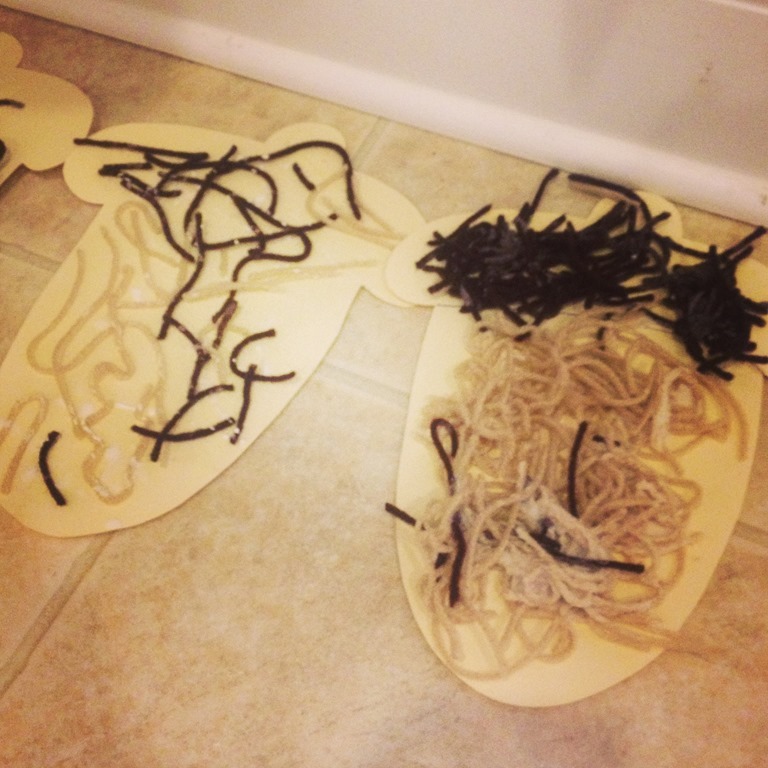 This sensory activity was really fun and interactive. Lots of exploring with the tubes and seeds, learning about the forest animals and their habitats too! 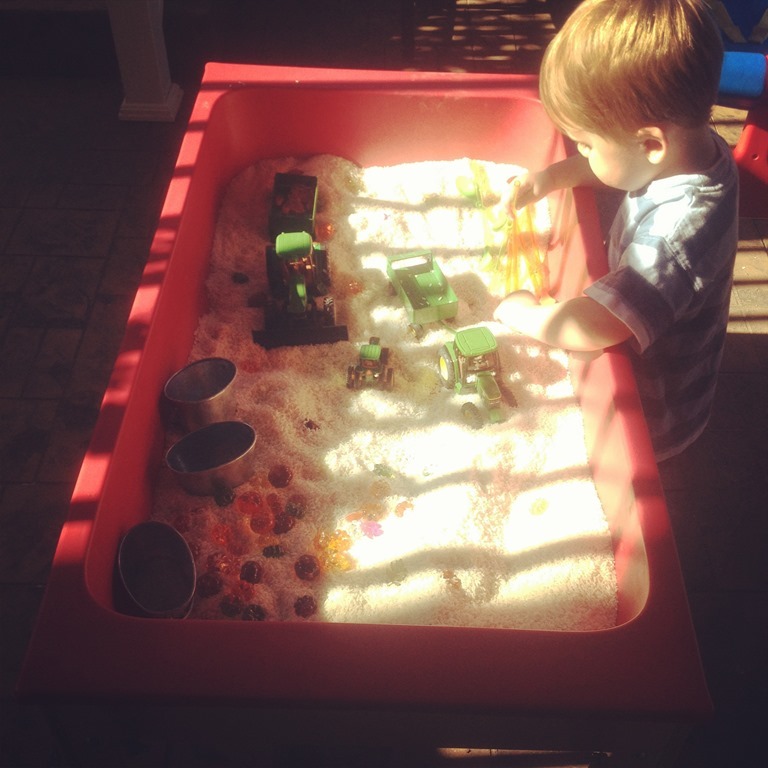 D is a huge fan of our sensory bins, and always the first to jump in to try them out! L is busy at the forest table too, she is also another little one that loves the sensory tubs. 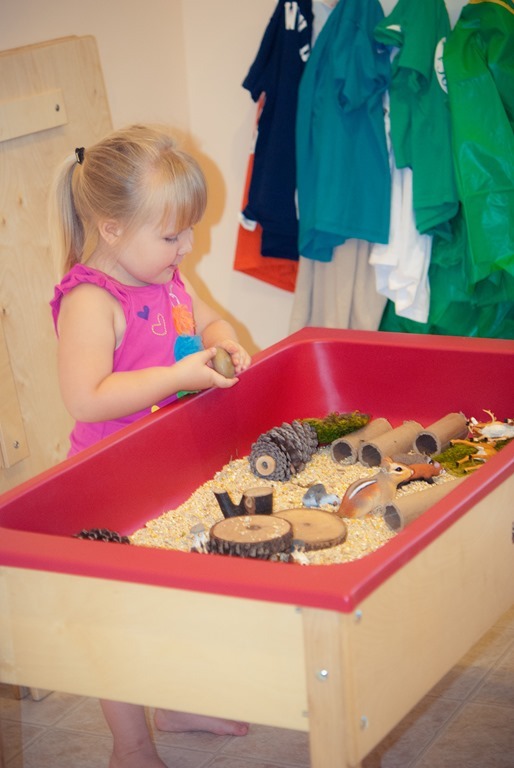 A new sensory tub that we added this week is an oatmeal tub. 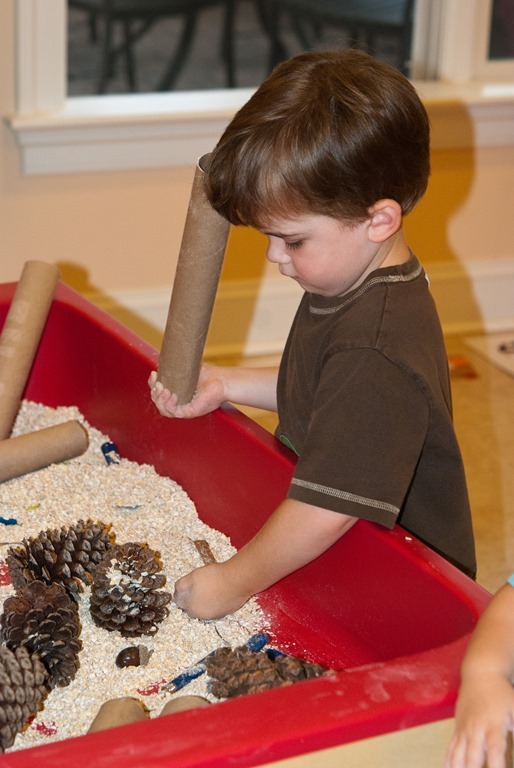 This one is simple, dried oatmeal, cinnamon sticks, pine cones, card board tubes, and spoons/scoops. Simple activities are often the best! L getting his hands dirty in the oatmeal! 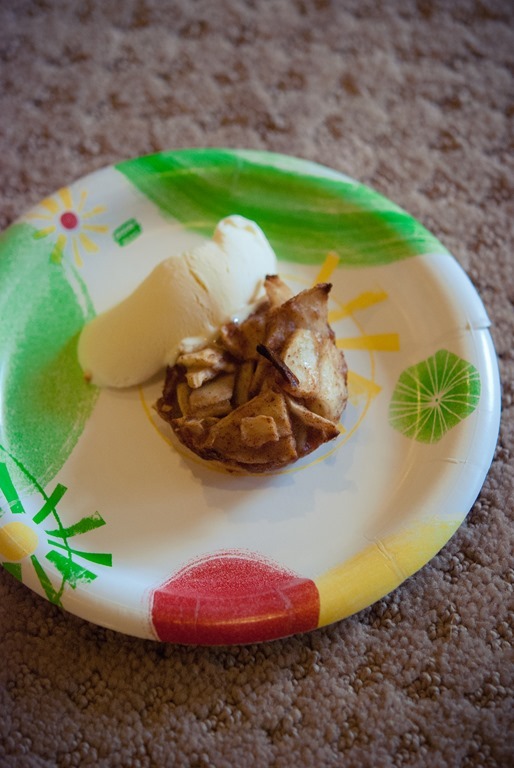 As part of our apple unit we decided to make some mini apple pies! This was such a fun activity! It was the first time that parents got to come and help us with a classroom activity too! 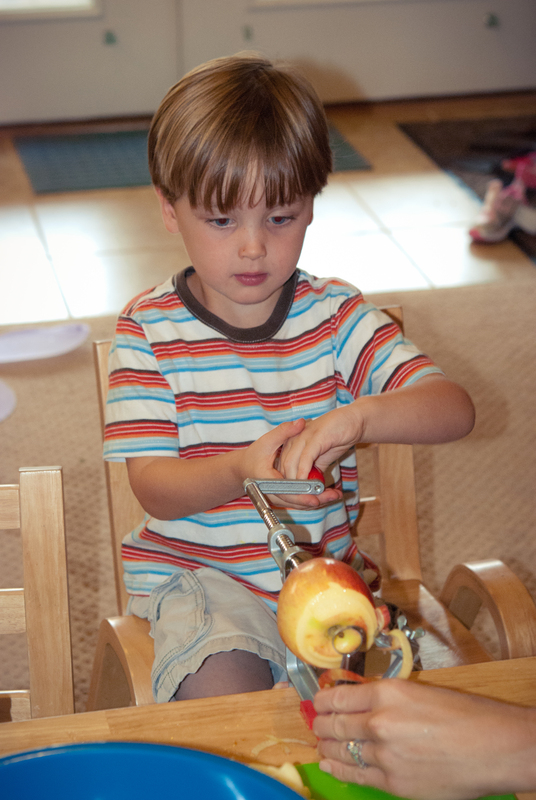 We peeled and cored the apples with tabletop apple peelers. The kids faces says it all! Then we measured, poured, mixed, and baked our little pies. Yummy! 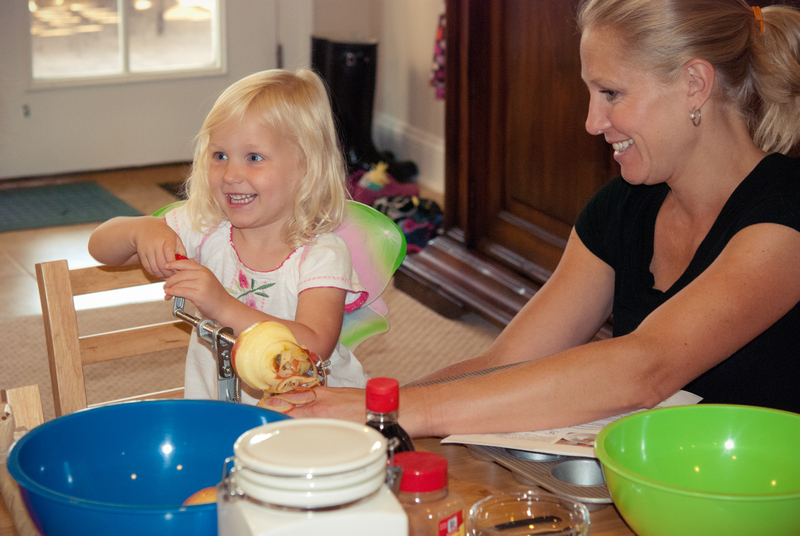 C and her Mom peeling our apples! M’s turn to peel, look at that concentration! Using a cookie cutter to cut out our pie crust. M gets a little help from mommy in the picture below. Big brother K, helping his little sister peel her apple. A crowd is forming! Time to eat our apple pies! I thought it was delicious, but it did get mixed reviews from both groups. The taste testers approved the dollop of ice cream though! Some of our apple art is hanging up around the classroom! We all worked together to create an apple orchard. 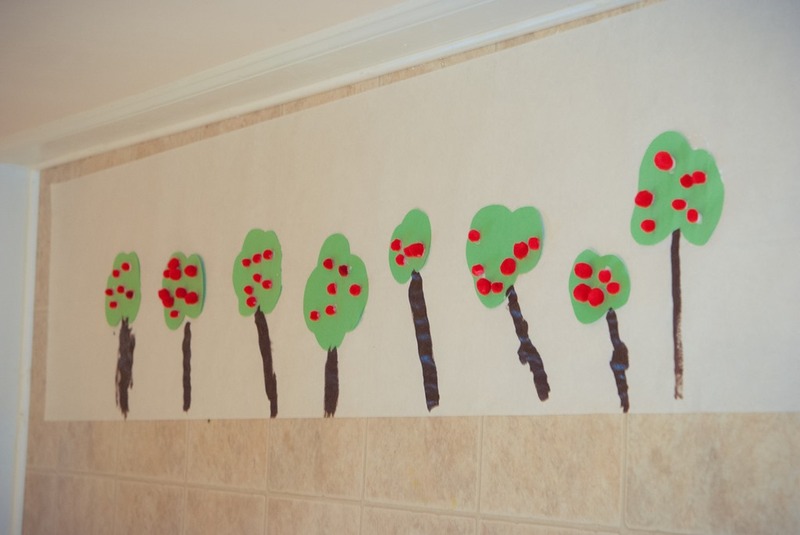 For this project I cut out the green tree tops, the children added as many apples to their trees as they wanted, helped me glue their trees to the mural, and then they painted their tree trunks. The finished product is stunning! 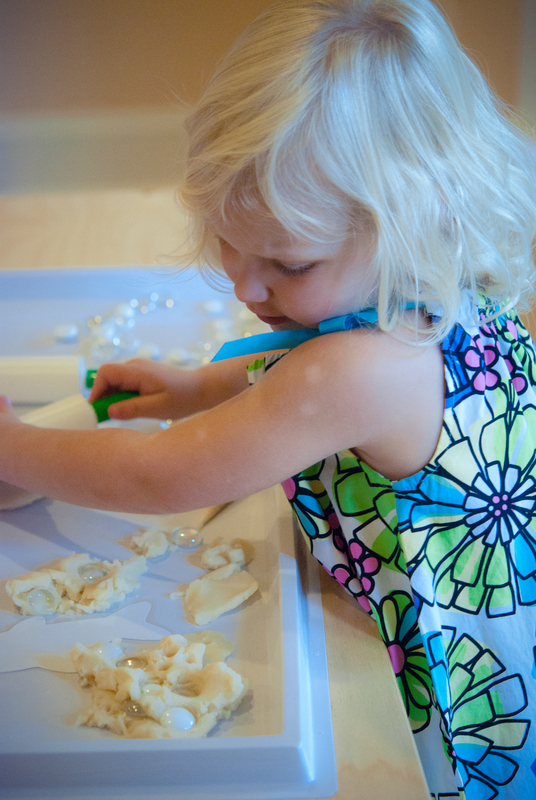 Last but not least, we have had more and more fun playing with our apple pie play dough. 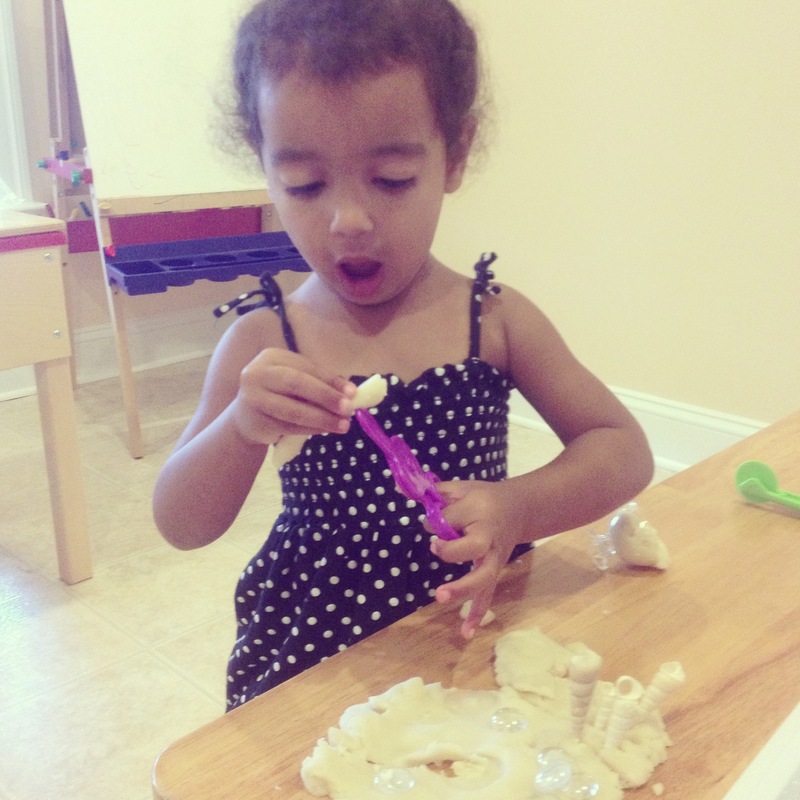 I posted all about my love for play dough play in this post. This week I captured some more images of children playing with the apple pie play dough, apple pie play dough mats, and the sticks. L working hard to make apples for his apple tree. P made a forest with the play dough and gems. “Apple cupcake anyone?” says M.
I love this photo of M working at the play dough table. 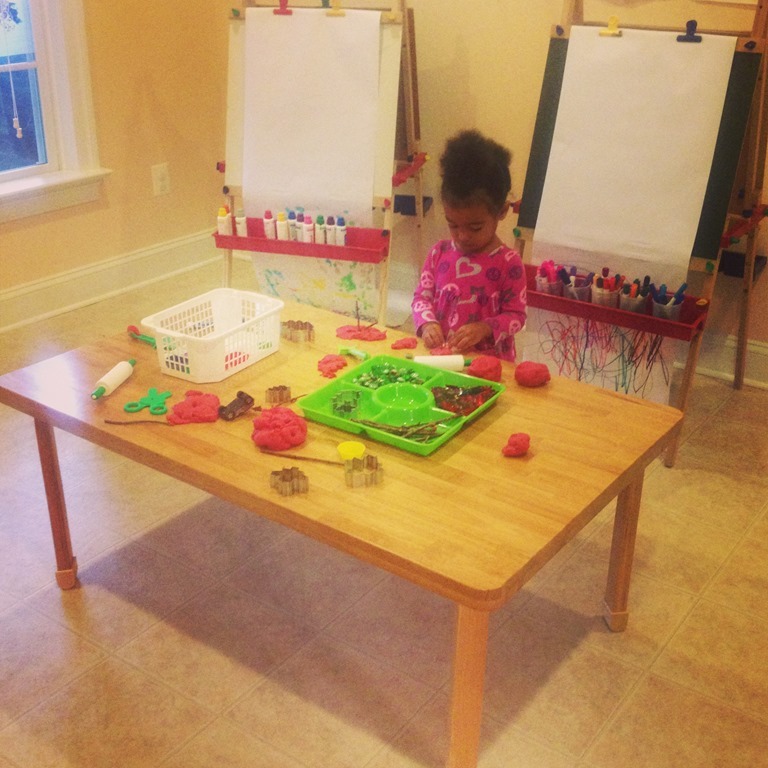 The remnants of lots of play dough play and used up easels behind her make me one happy teacher! Categories: education, play based learning, preschool, reggio emilia inspired | Tags: apples, cooking with kids, fall, fall themed units, fall themes, forests, play dough, playmatters, reggio inspired, sensory | Permalink. 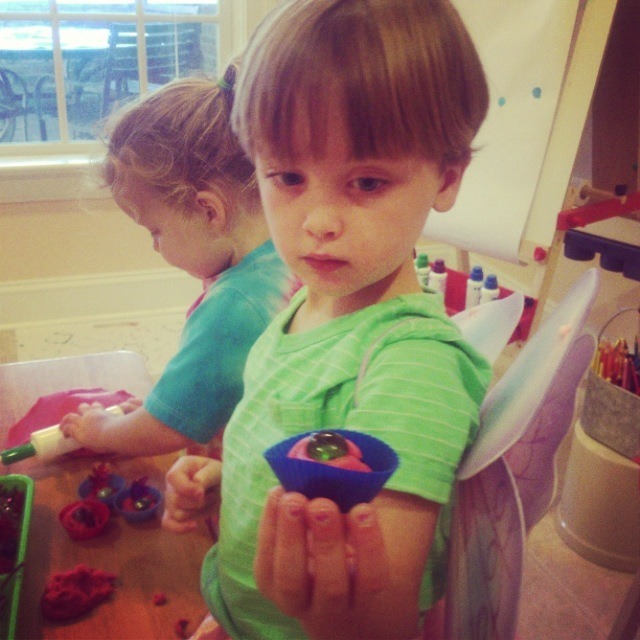 We cannot get enough of play dough at school right now! 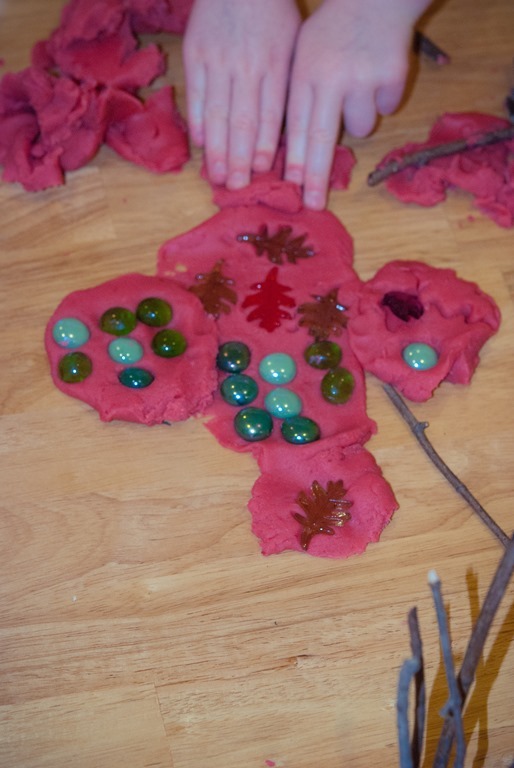 We love it so much that I wanted to do a post simply about play dough and the importance of this wonderful sensory tool. 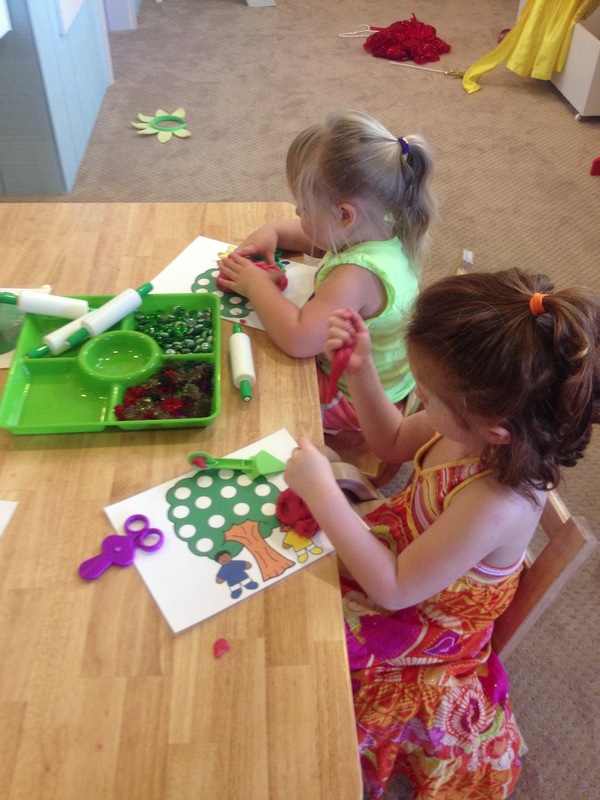 As an early childhood educator I truly believe that “play” is young children’s “work” in preschool. Through play a variety of goals are being reached, worked on and incorporated throughout their play experiences. 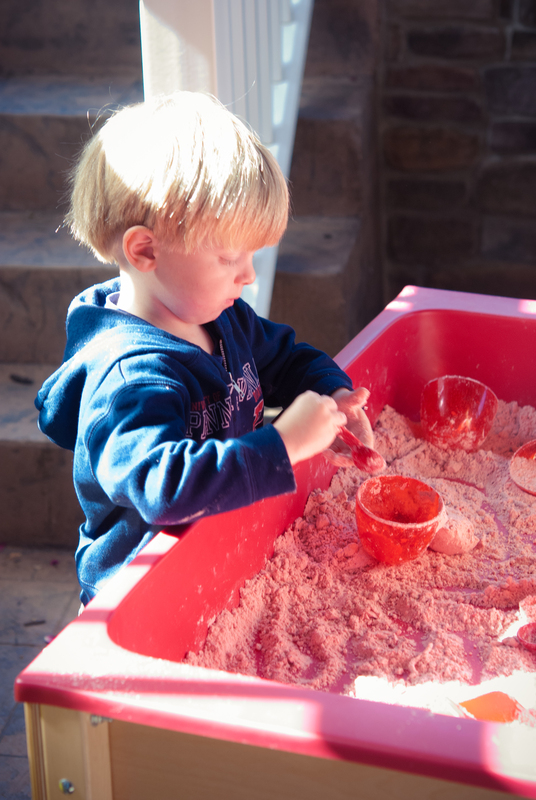 By highlighting something as simple as play dough I can better show you exactly how much can be learned through play. When children are all around the play dough table one of the greatest outcomes is building a sense of friendship and community. 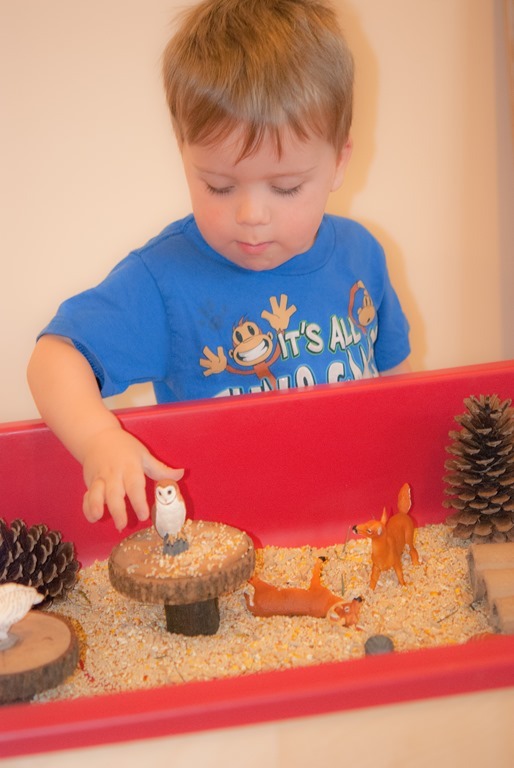 Because children are immersed in a sensory activity that is familiar to them they instantly start talking about what they are working on with their friends around them. 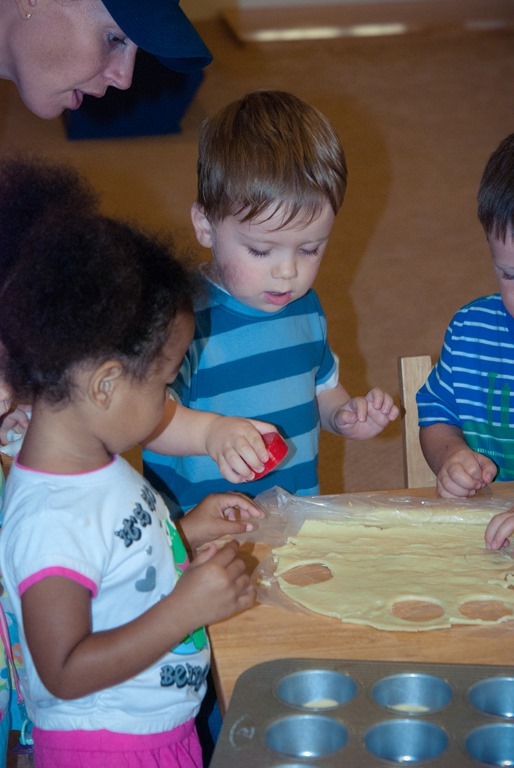 You will hear them saying, “I am making an apple pie” “I am squashing this play dough down.” “I am making a snake” This builds a sense of community and also each child’s own language and vocabulary from these discussions around the play dough table. Usually I will provide a theme to the play dough and slowly add to it day by day. 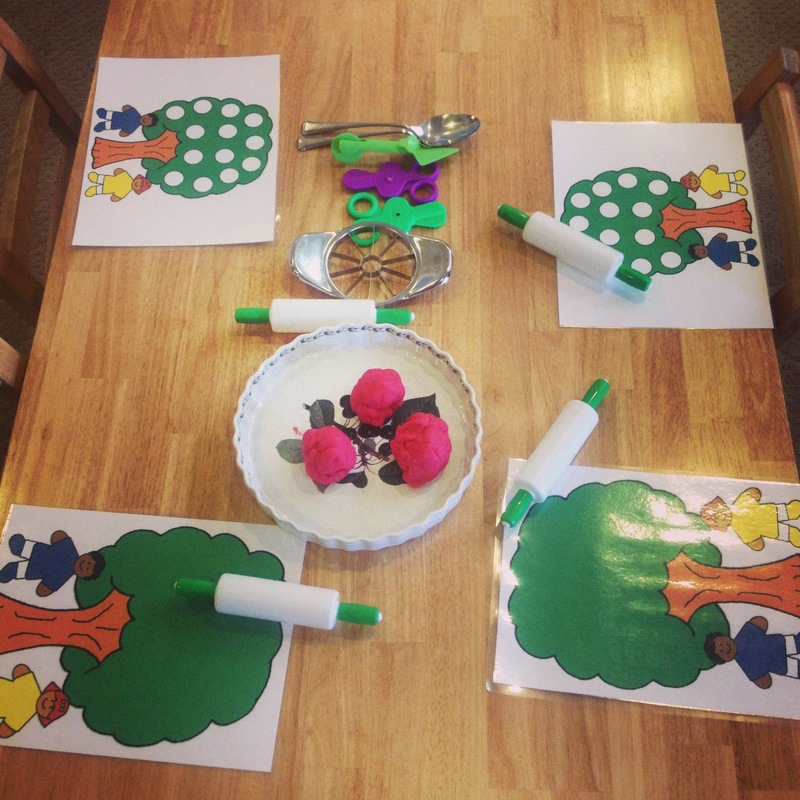 The first day I offered the red play dough I put it out with apple tree mats, rolling pins, spoons and scissors, and a pie pan to mimic making apple pies. Once children have played with the new dough and these materials I slowly start adding or taking away objects to encourage their play. 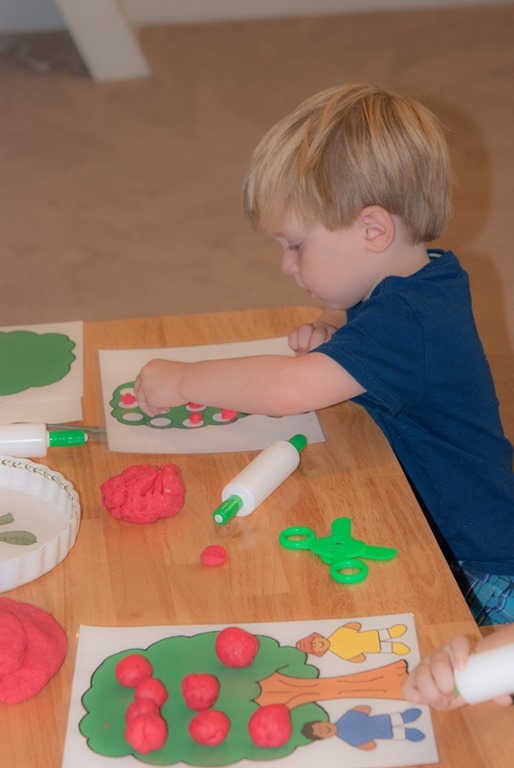 Many math concepts are learned by playing with play dough. 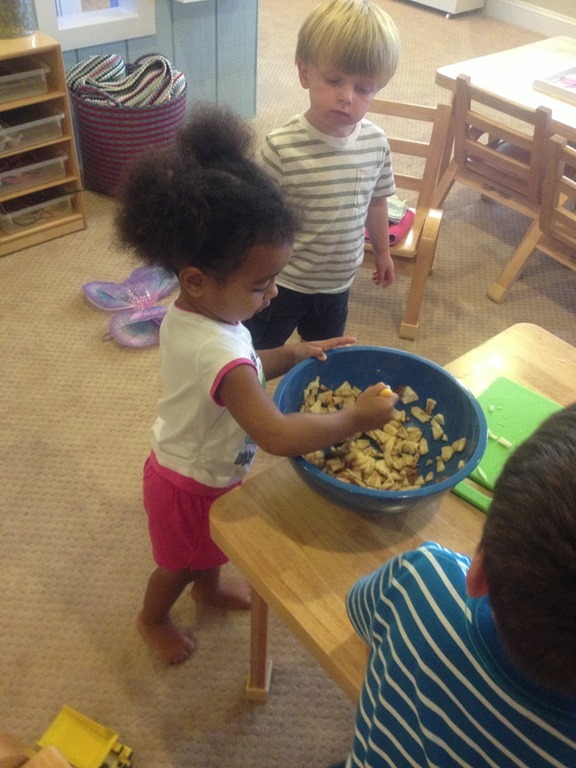 They can count the apples they made, they can compare and contrast sizes, and start learning many geometric concepts. You will hear these phrases: “I made mine the same size.” “This one is bigger.” “This piece is heavier.” “I squished my play dough on top of this piece.” The important mathematical words they are emphasizing are; up, down, over, under, top, bottom, inside, outside, in front, behind. This picture shows P rolling her piece of play dough into a snake and then using the scissors for cutting the play dough apart. This is building her scientific knowledge of the cause and effects of materials. If I pull or roll the play dough what will happen? How can I take this object and turn it into something else? What will happen once I cut this piece of play dough? How many pieces can I make? The concepts keep building and building on each other! This picture shows L squishing the play dough with her fingers. 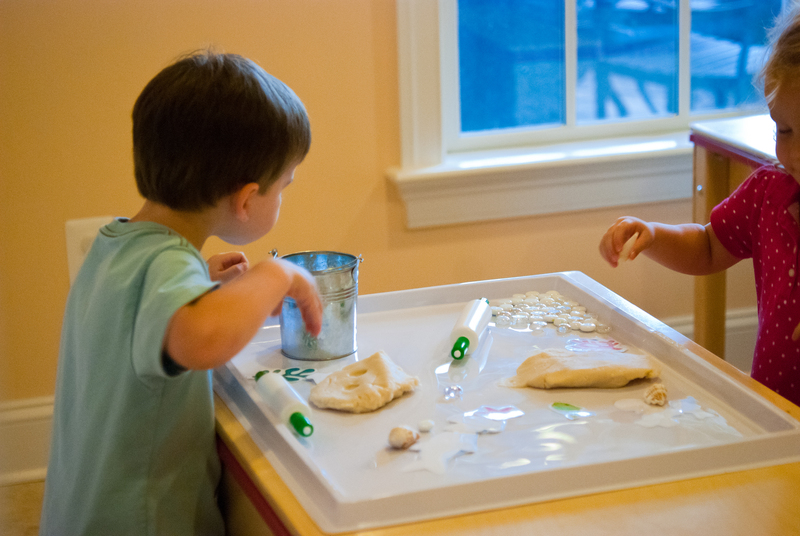 Play dough offers a lot of opportunity to build children’s fine motor strength. 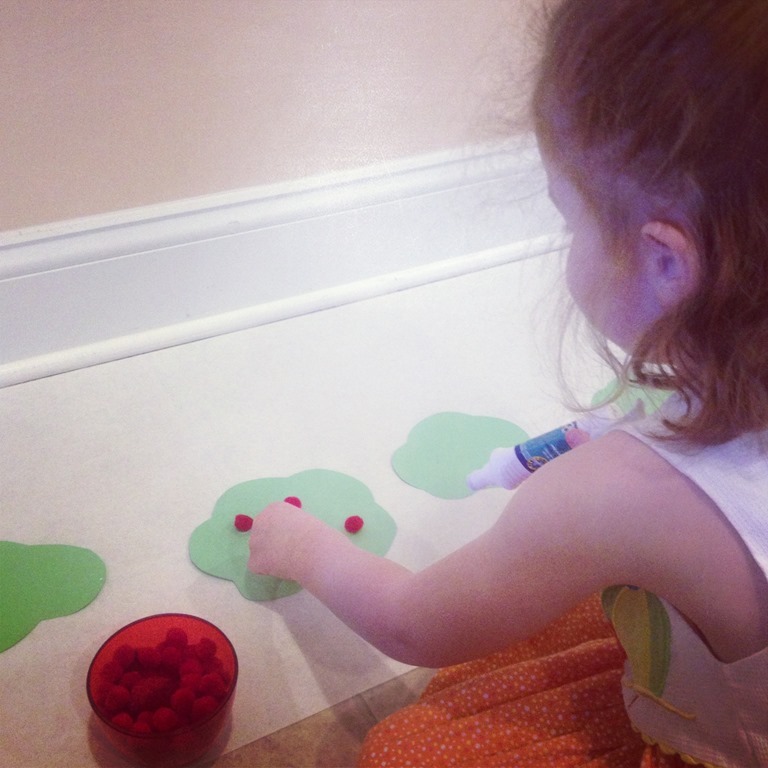 Fine motor is the coordination of small muscle movements in hands and fingers. Children need to build this strength so they can properly hold pencils, markers, scissors, hole punchers, and staplers. Every time L is squishing the play dough down she is slowly building this very important muscle group! 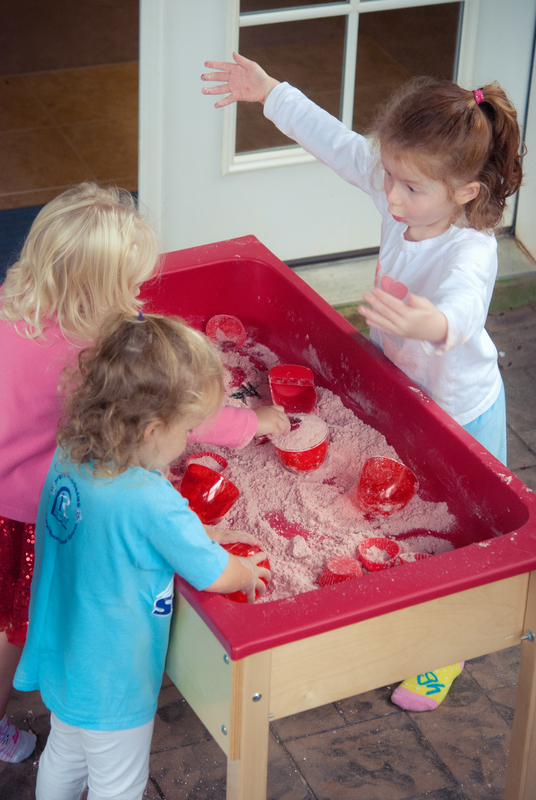 In the first few weeks of school I had a coconut play dough tray out for exploration. 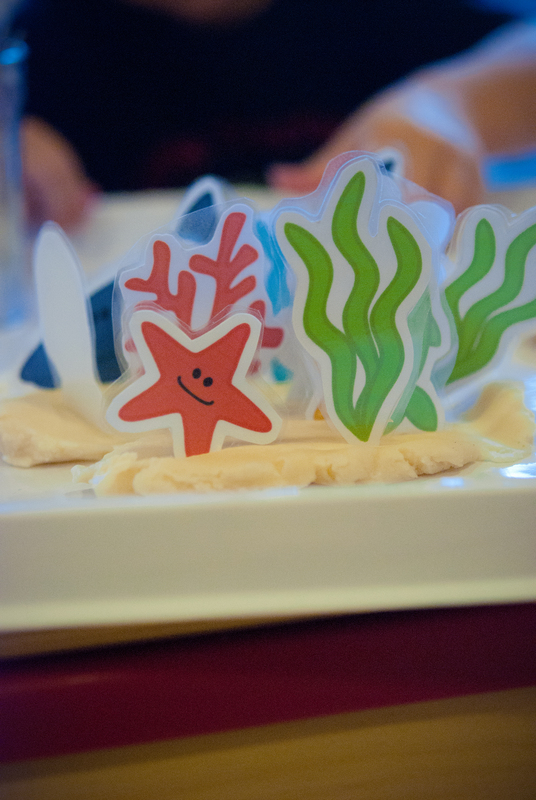 I added these fun sea creatures to the play dough tray for an added element. These sea creatures gave the children lots of vocabulary words to work on and discuss. “Where should I put my star fish?” “What is this grass stuff?” “What’s a coral reef?” It was fun to see them working together to explore the sea life pieces and how they each used them differently in their play dough. Many of the children started to act out little scenes with their sea creatures. 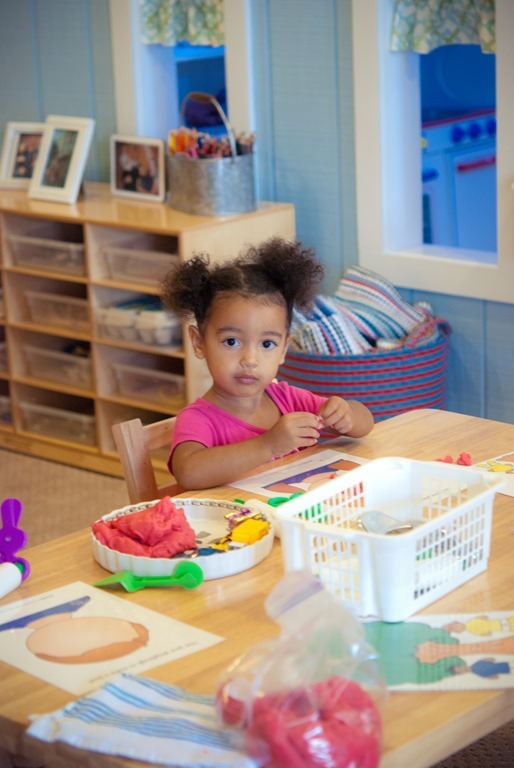 This is building the foundation of early literacy and pre-writing skills. 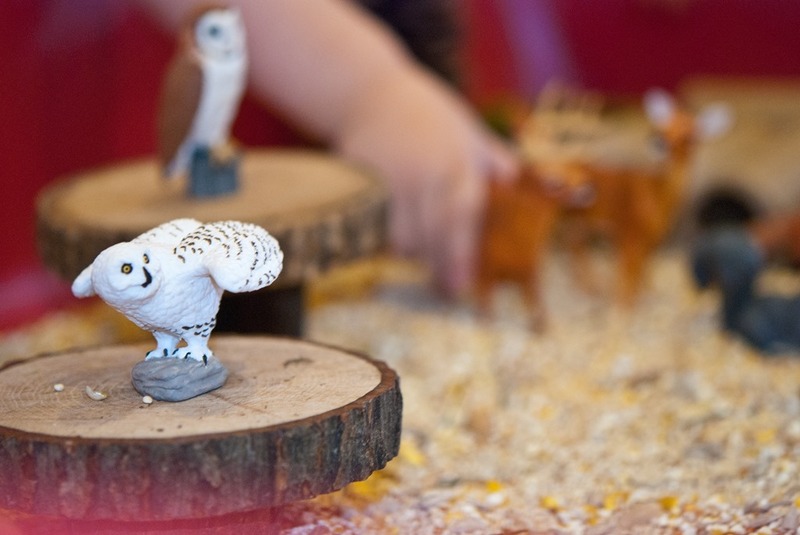 Children begin this by acting out or dictating stories through play. This is then transferred to paper and pencil writing as they grow older. 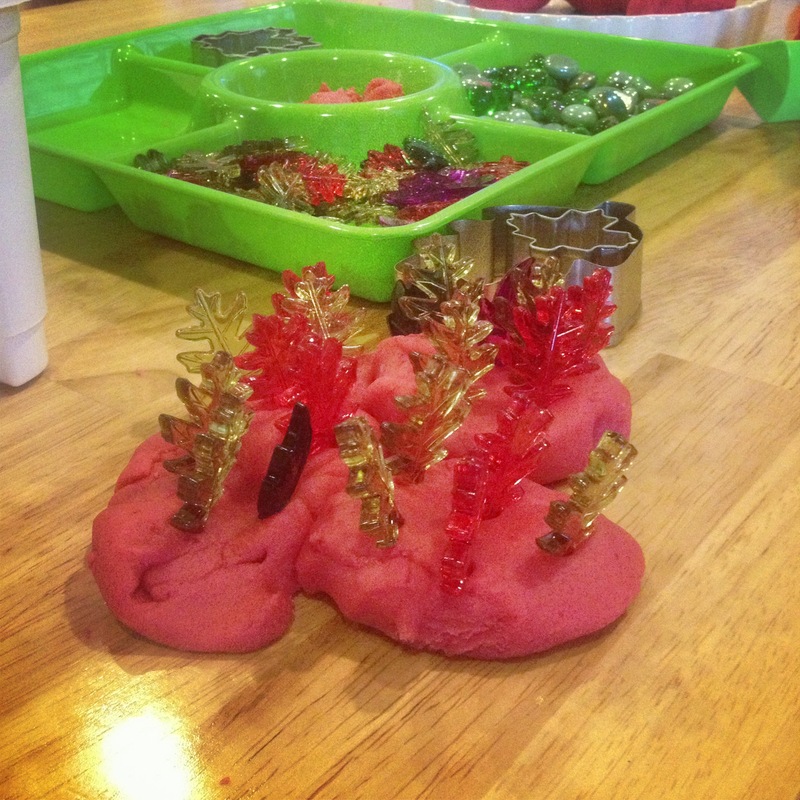 Along with the sea creatures I also had gems out for the children to put in their play dough. I put clear and white gems to go with our coconut and beach theme. 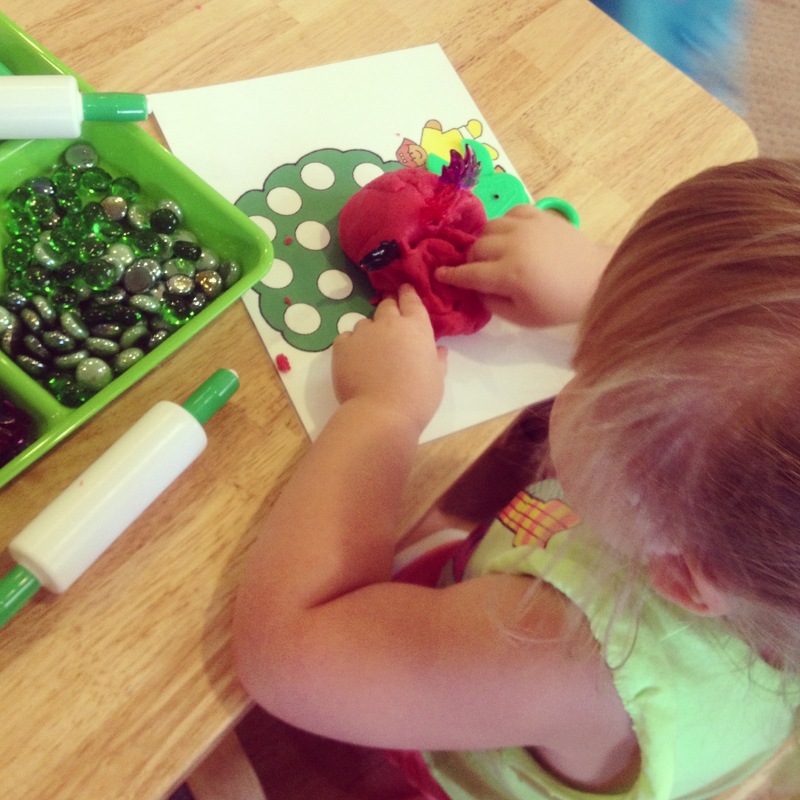 In the above picture you can see that C spent a great deal of time squishing all of her gems down into the play dough. This picture shows the amount of concentration and care that M is taking to cut her play dough apart. Play is work for them! 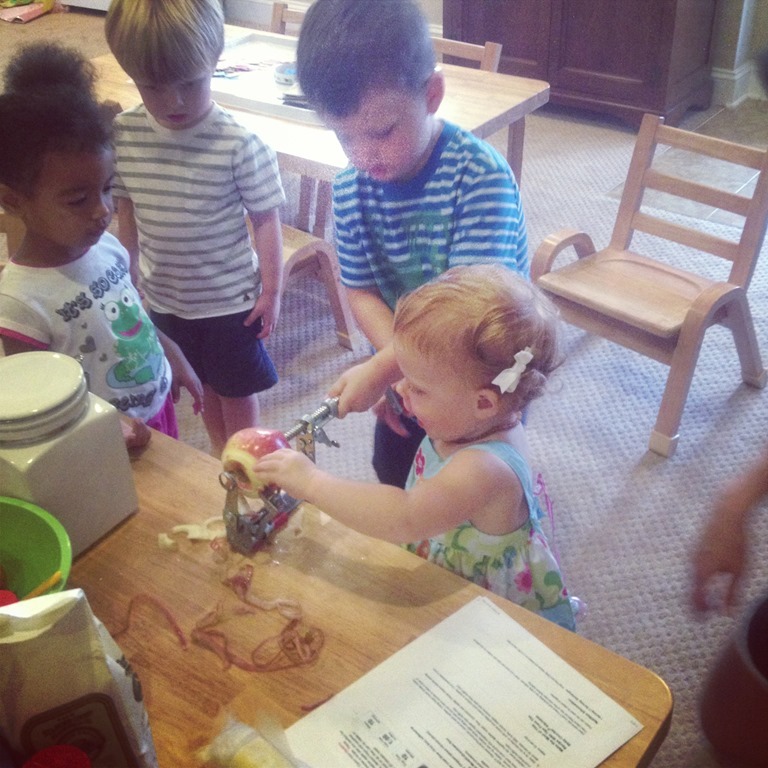 It takes a lot of muscles and brain power to cut apart the play dough. This is an impressive list of concepts we learn through playing with play dough! I have had a number of parents ask me about my play dough recipes and where I find all of my added materials for my play dough. 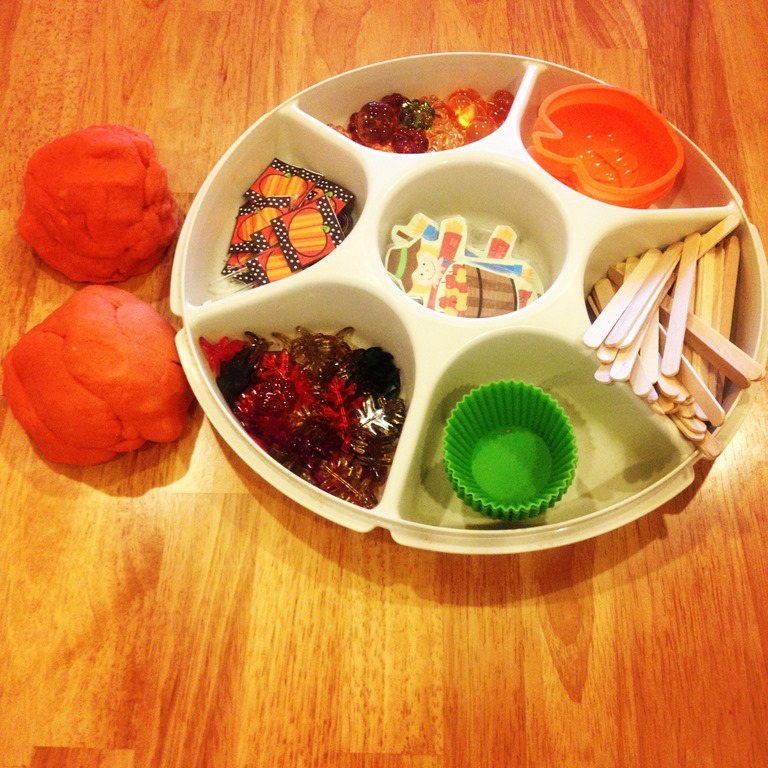 I am going to include my basic home-made play dough at the end of this post for you to make at home if you wish! 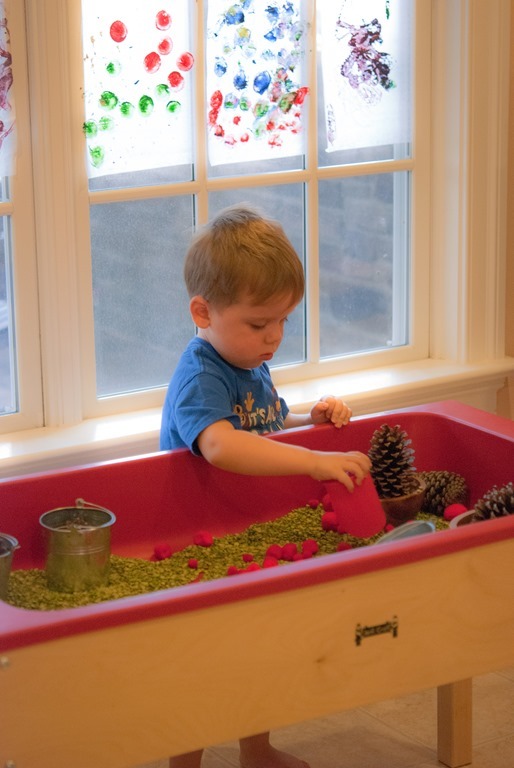 I am always on the lookout for great things to add to my play dough trays! Many of the gems and items I find at craft stores such as Michaels and Jo-Anns. The gems are usually in the flower areas for making flower arrangements. Some of the rocks I have found at Lowe’s or in the gardening area at Walmart. 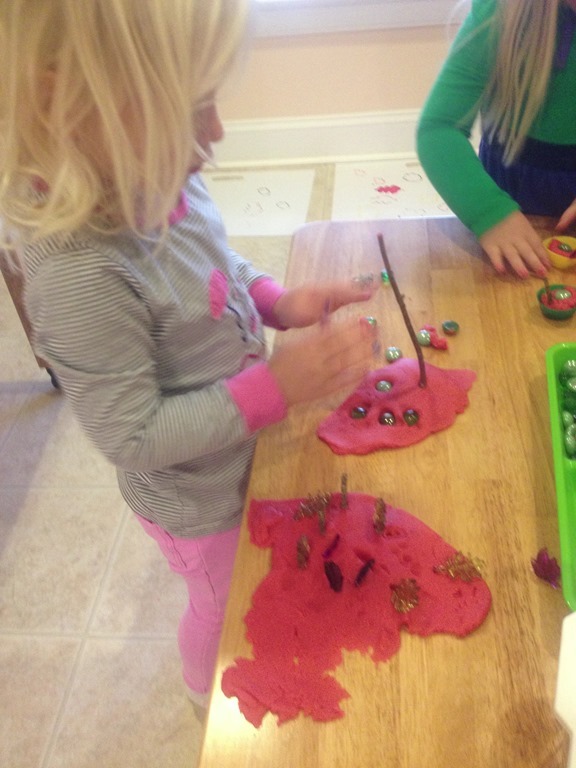 The little leaves that I added to the red play dough were actually part of a pumpkin and fall set for Michaels. I just removed the pumpkins for now and only included the leaves with the apple play dough. I will share more of my play dough tray ideas as the year goes on! For my parents, this is the play dough recipe that I have used for this school year. This is my Favorite play dough recipe. 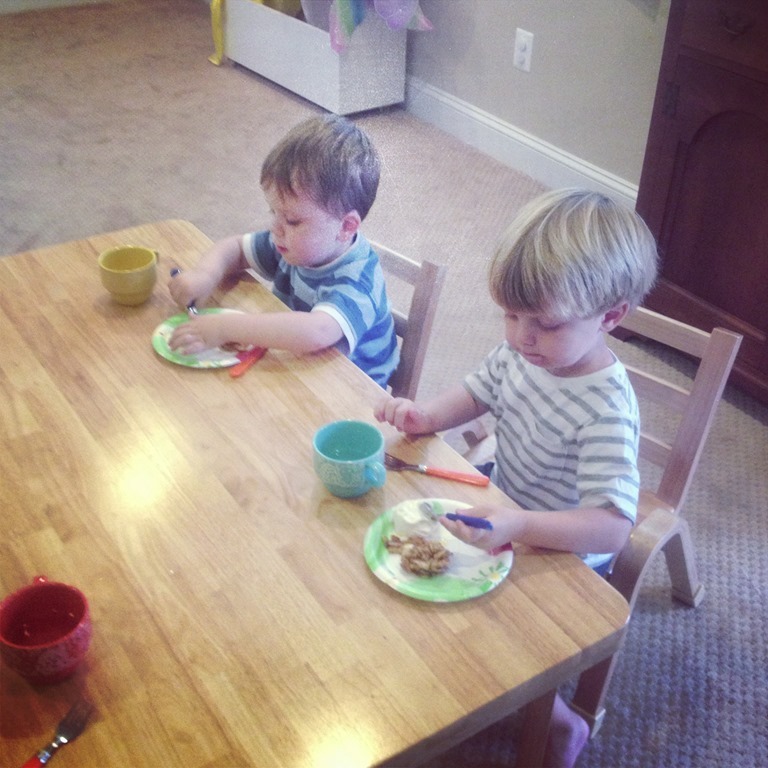 It super soft, easy for children to manipulate, and cooks up quickly. Mix the wet ingredients over the stove, mix the dry ingredients in a bowl, then slowly combine while heating on the stove. Once it starts to pull away from the pan and stick together put it on a piece of wax paper to cool down. If the color isn’t fully mixed don’t worry! Once you start to knead the play dough together the color will disperse throughout the dough. This dough will last roughly up to four months! I just keep my play dough in a large ziplock bag when we aren’t using it. Chocolate or Mud play dough: substitute one cup of cocoa for one of the cups of flour, keep the rest of the recipe the same! it will cook up smelling like chocolate and looking like mud! 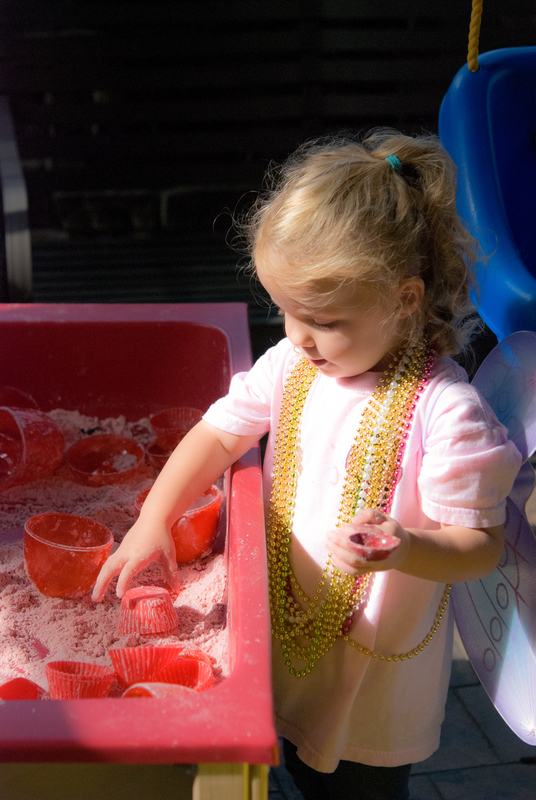 Add glitter to your play dough for some added fun! Have fun “playing” at home too! Categories: Uncategorized | Tags: apples, Dough, Early Childhood, importance of play, Play-Doh, playmatters | Permalink.